Willie James is a poet living in Chicago, IL. He is a poetry editor at Pacific Literary Review. 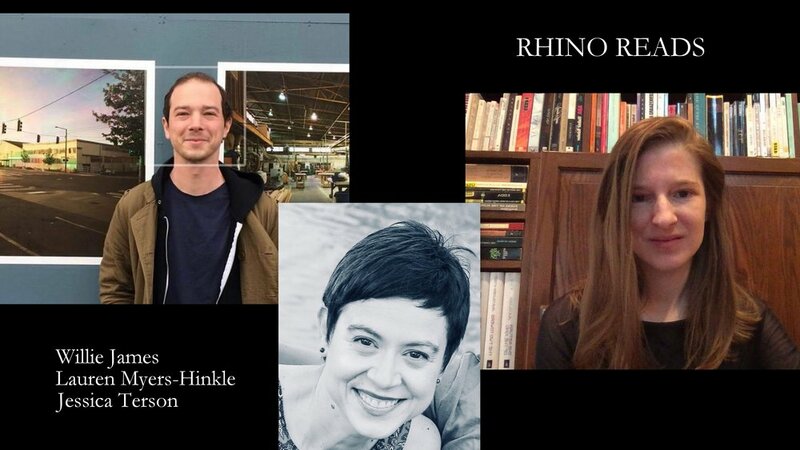 He was the runner up in Rhino’s 2017 Founder’s Prize poetry contest. His work has appeared in Rhino Poetry, Pageboy, as well as the Mantis Review. Most days he can be found at City Lit Books in Logan Square where he works as a bookseller. Please stop by and say Hi. Lauren Myers-Hinkle is an emerging poet interested in the intersections of poetry, illness, gender, visual media, and experiences of modernity. She completed graduate work in Cinema and Media Studies at The University of Chicago and lives in Evanston. Her poetry will appear in the 2019 issue of RHINO. She recently received an honorable mention in Carve Magazine’s 2019 Prose & Poetry Contest, and her work is forthcoming in the spring issue. Jessica Terson’s poetry has previously appeared in The Georgia Review, New Orleans Review (web feature), River Styx, River Teeth Journal, Southern Poetry Review, and elsewhere. Her prose has appeared in Beloit Fiction Journal, Cleaver Magazine, The Los Angeles Review, and other journals. She is currently a RHINO Fellow.